Sharon has a Bachelor of Science in mathematics education, a Masters of Science in educational psychology, and a Masters of Science in counseling. Sharon is a counselor at Kaneland High School (KHS) where she also has taught Math and worked with the Kaneland Advantage Program (KAP). She is finishing her career this year after 27 years and is excited about continuing her “learning” journey. She credits her family for allowing her to learn as much as she has and truly believes that her excellent choice of “education” as a career has had truly incredible consequences. Sharon was a math teacher for 19 years, KAP credit recovery program for 5 years, guidance counselor for the past 3 years. At some point in those 27 years, I was lucky enough to be able to spend some time with Sharon, because we shared a teaching supervision. As a colleague, we bonded over conversations about music, me being a band director and she being a former Bb clarinet player. In conversation just a few days ago regarding this weekend’s performance, Sharon said, “This will be my first time on stage.” The very statement, to me, seemed remarkable, as she has served as a leader in the Kaneland Educators Association and a sponsor or many activities at Kaneland, not to mention her time playing clarinet. I have never seen her be anything but intelligent, thoughtful, and graceful. She will be brilliant on Sunday, reading One Thing I Have Learned. Next up ….. Carol Alfrey! If you are already employed, what do you do? I am the Executive Director of Conley Outreach Community Services, where I do everything from write grants, organize Salvation Army kettles and run a grief camp to vacuuming floors and cleaning out refrigerators. Do you have a favorite story (that you’re not telling for the SHOUT OUT) that happened to YOU during your education? I was the drum major my senior year here at Kaneland, one of the first females to be chosen. I convinced the band director that I should wear a skirt and black shiny boots, instead of the baggy black pants. It was a very short skirt (it was the early 70’s). Not very warm in the latter part of the marching season, but oh so cute (or so I thought). Do you have any favorite teachers? If so, why were they your favorite? Dr. William Schlacks (the above mentioned band director)—he was the only teacher I ever had who reprimanded me. He was right and I respected him for it. He also let me wear the skirt. Dr. Bruce Balow, a professor at the University of Minnesota, a brilliant man in the field of autism, who farmed on the weekend and had season’s opera tickets. He was the epitome of a balanced life. Dr. Robert Bruininks, also from the University who is one of smartest people I ever met. Guileless, honest, sincere and laser sharp, he treated everyone, from the office assistant with developmental disabilities, to the Provost with the same respect and kindness. He would eventually become president of the University, proving sometimes nice guys do finish first. What subject in school was your LEAST favorite and why? Math. Too precise! Who do you feel is the hardest working person in an educational system and why? Every one of them, in their own way. Did you walk to elementary school or ride a bus? Any funny memories? Rode the bus. My bus driver was Mrs. Zerby. We were all terrified of her. After I grew up and got to know her, I discovered she was actually very nice. What excites you the most about education? It is not limited by time or space, age or ability. We are lifelong learners, with so much to discover about ourselves and our world. Education opens minds and doors and can break down walls. It creates futures and helps us learn from the past. It is oxygen for our souls. Carol has spent 40 years working in some aspect of education or human services. She holds an MA in Educational Psychology and a Ph.D. in Educational Policy and Administration from the University of Minnesota and is currently the Executive Director of Conley Outreach Community Services. A Kaneland graduate long before the auditorium was ever conceived, she is able to stand before you today because her high school speech teacher, Mrs. King, hunted her down for 3 years straight and forced her to compete in Forensics. Who knew After Dinner Speaking would actually come in handy someday? 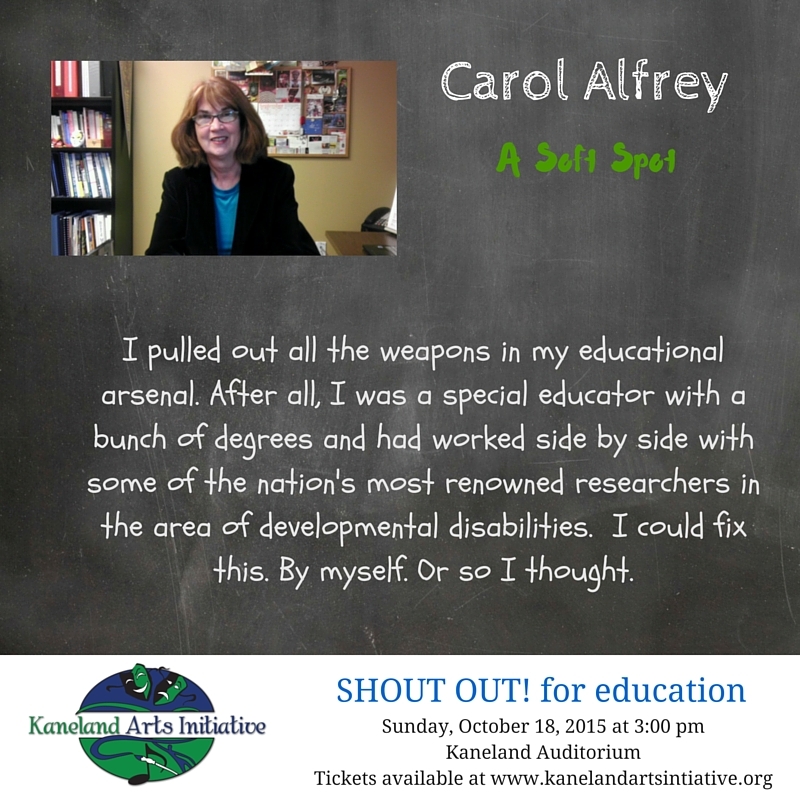 She is an avid supporter of KAI and is excited to be a part of the 2015 Shout Out to Education cast. Carol is married, has one son and is the only member of the household without perfect pitch. You will have a wonderful opportunity to hear her speech, A Soft Spot, on Sunday, October 18th at 3pm. CLICK HERE TO PURCHASE TICKETS TO THE SHOUT OUT!